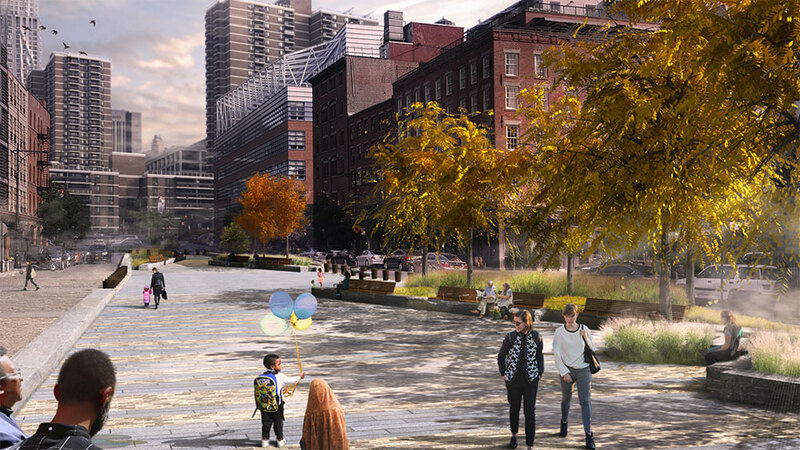 A decade-old plan to redesign the wedge of land known as Peck Slip Park is now scheduled for review by the city’s Landmarks Preservation Commission. Located between South Street and Water Street in Manhattan’s Financial District, Peck Slip Park measures about .65 acres and is surrounded by a school, a hotel, a parking lot, and a Con Edison electrical facility. For years, efforts to move the project forward were challenged by the local community board who did not see eye to eye with city officials and outright rejected previous proposals. Now, Park Department officials and urban designers have revealed detailed renderings of what the former parking lot could become if approved by the LPC. 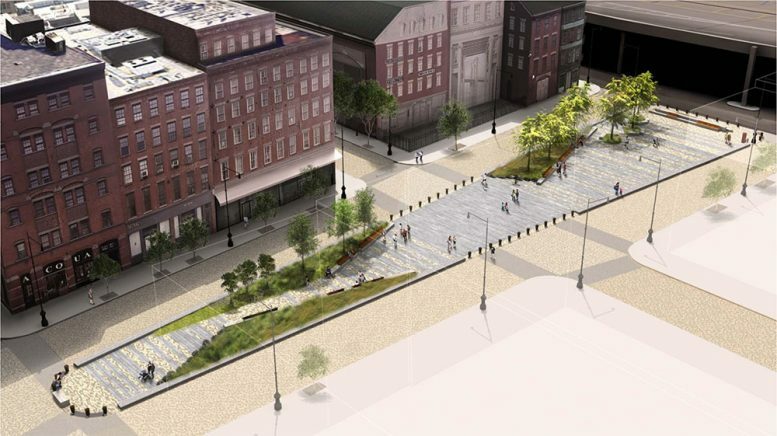 The city’s urban designers were inspired by the existing cobblestone work in the surrounding area, and have proposed pavement that is contextual in both palette and size. Proposals also illustrate linear granite bands that span the the width of the park on the east and west boundaries. Planters at the east and west edged of the park will include a variety of perennials including birch, elm, and honeylocust trees, ornamental grasses, and Blue Amsonia. Stone and wooden benches will be installed at the edge of the planters. Construction is expected to begin in the third or fourth quarter of 2019 and wrap up in about one year. 7 Comments on "Plans to Reconstruct and Redesign Peck Slip Park Head to LPC For Review"
Why in God’s name would the small but vocal clique of CB1 members who opposed projects here in the past be content to allow this site to remain the God-awful thing it is – a creepy concrete wasteland with a crappy parking lot? I mean, it’s one thing to reject a proposal because you genuinely believe it’s not a good fit with its surroundings. But CB1 shouldn’t have stopped there, you have to bring pressure to bear on the Park Department and the designers and tell them to come back with a much improved plan, and do so quickly. For CB1 to be content to allow this to drag on for years and years amounts to incompetence, plain and simple. 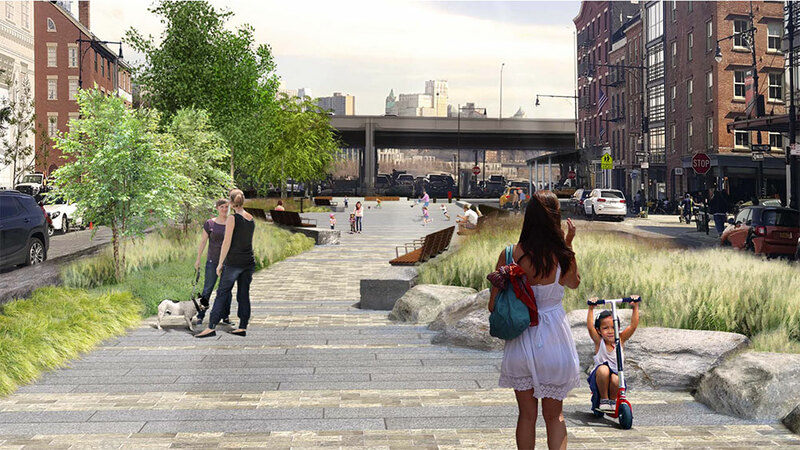 What they SHOULD do, if they had any vision, is dig out the old slip and let the East River in to make a charming canal or basin surrounded by cafes with outdoor seating, trees, flowers. . . A little Amsterdam. And put all the businesses further at risk of flooding? I think not. NYC isn’t about giving land back over to the rivers – we fill them in and expand. Flooding wouldn’t be an issue. Just put flood gates where it joins the river (which of course in not really a river). It could be really beautiful. Mark my words – a kid is going to get killed playing in this park. All it takes is one to slip over one of the sidewalls from behind a tree — and it’s over. Is this thing definitely final? Is this really the best they can do? Why not open up the entire Peck Slip to pedestrian traffic? Who in the hell parks in that area anyway? Is it reserved for city employees? That might explain the years long lack of progress. Strike my last post, the area is currently nothing, literally nothing with boulders surrounding the nothingness. That’s great CB1 made headway. So when does construction start? These public agencies need to become more accustomed to moving close to the pace of the private sector.